The bulk of vanadium produced globally is used in the steel making industry where it is used to add strength via various alloys, with demand from steel makers forecast to increase with the advent of stricter standards on the strength of steel to be used in construction. Vanadium also has great potential as an energy mineral, with its application in battery usage for large scale energy storage predicted to lead to a strong increase in demand for the commodity. Developed in Australia, vanadium flow redox batteries (VFRB) have a longer lifespan than most current batteries and can hold a charge for up to 12 months. The batteries are scalable, enabling large-scale storage facilities to be constructed for use at renewable energy facilities (e.g. solar farms) to small town energy storage and down to a household level. Vanadium is commonly traded as Vanadium Pentoxide (V2O5) and the development of new VRFB facilities is currently constrained by the absence of “battery-grade” V2O5. The price for >98% V2O5 has increased significantly over the past few years from US$3.50/lb to current prices of around US$15.45/lb (source: www.vanadiumprice.com, 03 May 2018). 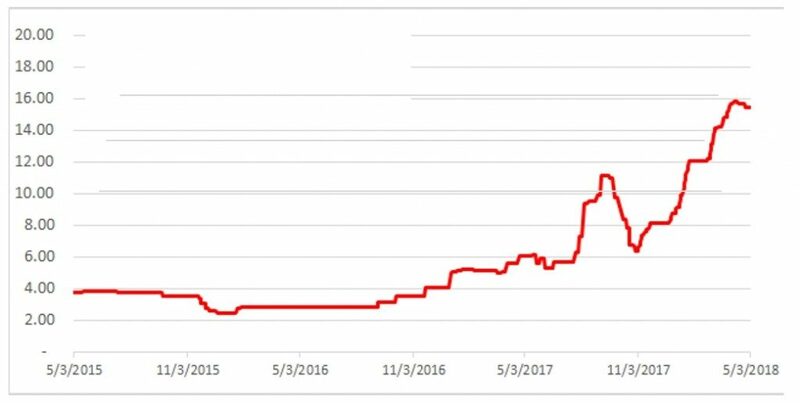 Three-year price chart of V2O5 Vanadium Pentoxide Flake 98% Price USD / lb showing the dramatic rise in prices over the past 12 months (source: www.vanadiumprice.com, 03 May 2018). Lithium is the lightest known metal and occurs in nature as compounds within hard rock deposits and salt brines. Lithium has a broad range of uses and has traditionally been used in aircraft manufacture through to the production process of glass and ceramics. With a wide range of industrial applications lithium is a primary component of the fast-growing battery technology market, which includes tablets, laptops, cell phones, electric and hybrid cars and grid storage. Coupled with the global shift towards social responsibility and worldwide desire to reduce carbon emissions this has led to a direct increase in lithium consumption. Sony was the first company to manufacture and sell lithium ion batteries over 25 years ago. Tesla and Panasonic are further driving the popularity of lithium with the rollout of electric cars. Due to the rising cost of petrol combined with the low cost of producing lithium batteries it is expected that there will be a double-digit increase in lithium demand primarily driven by electric vehicle sales during 2018. There are concerns that the demand for lithium will outstrip supply. Lithium demand expanded 17%, outstripping supply in 2017.